The personality types just discussed are incredibly powerful. And, as you can probably tell, they’re simple to identify. By simply noticing the tonality of the caller, you can immediately place them in one of the four personality types. You can then match them, and press forward with the additional traits I described each personality as having. Again, calibration is key. If someone has a slow monotone voice, it’s likely they’re a green. But, they may also be a red. Or a gold or a blue! So it’s crucial you never ASSUME anything. Get an idea of who you’re talking to, place them in a personality category, and see if it works. If it doesn’t, reassess their personality, calibrate to match them again, and move forward. Remember, your caller will be greatly impacted by you if they can tell you CARE enough to understand who they are, what they want, and how they communicate. So take the time to do so, every call! In this section, I’ll describe brief exercises you can do yourself, or with your sales and support teams. These exercises are meant to help you quickly identify who you’re talking to, match their communication style, and understand what they’re really saying. These exercises are most efficient when used with recorded calls. Replay the calls several times, until you can get a real grasp on who the person was, and why they’re that type of personality. Remember… words only make up a tiny fraction of real communication. Be an observer, and observe HOW the words are being spoken. This will let you TRULY address the caller and give you the best chance of making the sale, or solving their problem. For this exercise, get a minimum of 10 recorded calls. Play them back one at a time. Pause the call after the first sentence the caller says. Identify their personality based on their vocal tonality. After you’ve identified their personality type, continue listening to the call. Look for clues that show you’re right in your assumption. For example, if you identify the caller as red, see if they know exactly what they want in the call, and take charge. If your 10 calls all have similar personality types (unlikely), make sure you find additional calls, until you have clear examples of every personality type. This exercise is designed to train you to OBSERVE vocal tonalities from the very first sentence. As you continue to do this exercise with 10 new calls, you’ll find yourself getting in the habit of observing vocal tonalities first. You’ll find that as you start a call, you’re much more focused on HOW the person talks, instead of what they’re saying. A side benefit of this is you get “out of your head”, making nervousness in the call an unlikely occurrence. In this document, I’ve mentioned several times that it’s not WHAT a person says, it’s HOW they say it that matters. Sounds good. But how do you put it into practice? Communication, for all its variety, is almost binary in nature. At the end of the day, it all boils down to a YES, or a NO. If an individual associates positively to a subject in a conversation, they will have a YES, positive approach. If they associate negatively to a subject, they’ll have a NO, negative approach. The key to determining what a customer is really saying, is to identify their YES and NO tone right off the bat. The first, is an almost guaranteed YES answer. The second is an almost guaranteed NO answer. They will likely say “no”. When they do, observe their tonality. This is the SAME tone they’ll use when saying “no” throughout the call… even if they’re not directly saying “no”! There’s a good chance this will be a solid yes, so note the tonality. Now, although your YES and NO questions should be somewhat obvious, don’t be TOO obvious. Some people, when asked an obvious YES or NO question, will respond sarcastically. So you shouldn’t ask a question like, “Is it important to get the best care for your dog?” – this is too obvious of an answer, which will cause the caller to be suspicious. So asking a direct, obvious question like that, may cause them to respond sarcastically. Again, call recording to the rescue. Try out some YES and NO questions, and listen to the calls afterwards. Make sure you’re truly getting a YES and NO tonality… not a sarcastic response. This exercise will train you to know if the customer is speaking from a position of YES, or speaking from a position of NO. If your customer is saying “yes”, but their voice tonality is saying “NO”, you can understand what they’re really trying to communicate. They may be feeling pressured to respond with a “yes”, even though in their heart they mean “no”. So you can now move forward in the call knowing your prospect is in a “no” state of mind, instead of continuing to speak to them as if they’re a “yes”. In a sales or support call, it can be easy to blurt out the answer to whatever the caller wants. For example, when asked the price of your item, it’s most tempting to flat out say it. However, this can be the least effective sales and support technique. It’s better to get further information about the caller, before making any flat statement. The best way to control the pacing of the conversation, and deliver information in the right way, is to start with questions. For example, if a caller immediately asks the price of your service, you can ask the question, “What are your goals for using our service?”, or, “What’s important to you about this project?”. By using these questions, you slow the caller down, and get a big picture for what they’re really looking for, and how you can best offer it to them. For this exercise, first set a goal or objective you want to meet with every call. For a sales call, the objective could be to make the sale, or move forward (maybe set a meeting). For a support call, the objective could be to get high ratings on a post-call survey, or X number of positive mentions on social media. Create some questions designed to lead the conversation towards the goal. When a caller calls in, after brief small talk (if necessary), begin asking questions. Then use call recording to play back the calls and see if you were able to meet the goal. When you do meet a goal, replay that call and identify exactly which questions helped the call reach that goal. As mentioned earlier in this document, every call will have rises and drops. A rise is when the conversation takes a positive upturn. A drop is when the call takes a negative turn, and rapport is lost. A rise is most often a positive event that is very good for the conversation and meeting the goal of a sale or positive support interaction. The strategy for handling a rise, is to “stay in the joke”. Comedian Louis C.K. tells a story illustrating the importance of this technique. He says that early in his career, he’d have a very set script for what his jokes would be. As he told his jokes, he’d get varying responses from the crowd, and power forward. Sometimes, he’d get a big laugh off a joke that he didn’t think would be a hit. This would startle him and he would simply move on to the next joke, which killed the momentum of his previous joke. Comedian Jerry Seinfeld told him that when his audience reacted well to a joke, he should “stay in the joke”. So if the joke was about him being angry, and the crowd started laughing, he should continue being angry, and improvise as the audience is laughing. In other words, when he got a “rise” out of the audience, he should stay in the state that got that rise and ride it out. This is exactly how you should handle a rise in a sales or support call as well. Instead of directly moving forward, “stay in the joke” and let the rise coast out. Then when you feel it’s right to move forward, do so. To handle a drop, the strategy is almost the exact opposite. When a drop or stall happens in a conversation, you should be unfazed, and power through it. For example, a drop could be an “awkward silence”. If this is the case, it’s your responsibility to restart the conversation and get it moving forward. The easiest way to do this is by asking a question or make a statement regarding the product. For example, if you talk about the price, and it brings about a drop, go back over the product. Maybe tell a story relating to the product. Now, many of these drops can be prevented by using the question method, as outlined earlier. However, a drop doesn’t necessarily mean a lost sale. In fact, in many cases, it doesn’t even come CLOSE to that. By powering through drops, you can eventually get a rise out of the call, and continue moving towards your goal. For this exercise, get at least 10 recorded calls, and play them back. Identify any rises and drops in the call. Get used to knowing the “energy signature” of each, so you can tell immediately in a call what’s happening. Use the recordings to determine whether or not effective strategies were used in handling the rises and drops. After you’ve practiced these techniques, use them in your own calls and listen back to your recordings to see how you improve. Identify if you were able to “stay in the joke”, or power through a drop. Take notes on how you could do things differently in upcoming calls. 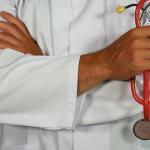 A good sales script is the lifeblood of any sales driven organization. It’s what will drive you consistent revenue, again and again. But getting the perfect sales script is very difficult. As I mentioned earlier in this document, you might have a script that’s bringing in sales. But maybe a different script could bring you 3x as many sales! One way to know is through call recording. Now that you understand personality types and the rise and fall nature of a conversation, you have the tools you need to help optimize your sales script. First, start with the script you have. Then, play back recorded calls that use the script. Identify personality types and whether your script is effective with all four types. Look for rises and drops in the conversation and see how your script works with them. Whenever a drop leads to a missed sale, see if you could use the question method, or the power through method, to save the call. Pay special attention to “closing” parts of the call, mainly, where you mention price or push for the next step or sale. Work these parts over and over again, and always play the recordings back to see how they do. Whenever a call makes a sale, listen to that call and identify WHY that call made a sale. Then use it as an outline for your call scripts. Remember that all personality types handle calls differently. So, if necessary, make a script for each personality type. Or, have a looser script, which your team can improvise based on the personality of the caller. By using this system repeatedly, you’ll create the most optimized sales script possible. You can then use this with new team members to scale your business and dramatically increase revenue. 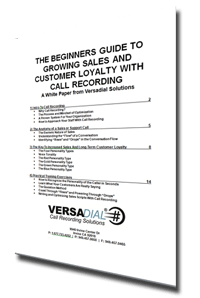 This excerpt is Part 4 of 4 from The Beginners Guide to Growing Sales and Customer Loyalty with Call Recording (White Paper).